New/unworn Omega Speedmaster 38 Orbis Co-axial Chronograph 324.30.38.50.03.002. 38mm stainless steel case. Sun Brushed Blue dial with luminous silver-tone hands and index hour markers. Luminescent hands and markers. Date display at the 6 o'clock position. Fixed stainless steel bezel with a blue aluminium top ring showing tachymeter markings. Three Light Blue Chronograph sub-dials displaying 60 second, 30 minute and 12 hours. 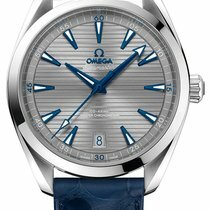 Omega Calibre 3330 automatic movement with a 52-hour power reserve. Scratch resistant sapphire crystal. Orbis Teddy Bear stamped on the case back. Stainless steel bracelet with push button release Deployment clasp. Water resistant at 100 meters / 330 feet.